The impressive correlation between cardiovascular disease and glucose metabolism alterations has raised the likelihood that atherosclerosis and type 2 diabetes may share common antecedents. Inflammation is emerging as a conceivable etiologic mechanism for both. Interleukins are regulatory proteins with ability to accelerate or inhibit inflammatory processes. A novel interleukins classification is described, based on their role in diabetes and atherosclerosis, hypothesizing that each interleukin (IL) acts on both diseases in the same direction – regardless if harmful, favorable or neutral. The 29 known interleukins were clustered into three groups: noxious (the "bad", 8 members), comprising IL-1, IL-2, IL-6, IL-7, IL-8, IL-15, IL-17 and IL-18; protective (the "good", 5 members), comprising IL-4, IL-10, IL-11, IL-12 and IL-13; and "aloof", comprising IL-5, IL-9, IL-14, IL-16 and IL-19 through IL-29 (15 members). Each group presented converging effects on both diseases. IL-3 was reluctant to clustering. These observations imply that 1) favorable effects of a given IL on either diabetes or atherosclerosis predicts similar effects on the other; 2) equally, harmful IL effects on one disease can be extrapolated to the other; and 3) absence of influence of a given IL on one of these diseases forecasts lack of effects on the other. These facts further support the unifying etiologic theory of both ailments, emphasizing the importance of a cardiovascular diabetologic approach to interleukins for future research. Pharmacologic targeting of these cytokines might provide an effective means to simultaneously control both atherosclerosis and diabetes. The impressive correlation between coronary artery disease (CAD) and alterations in glucose metabolism has raised the likelihood that atherosclerosis and type 2 diabetes may share common antecedents. It is now known that adverse environmental conditions – perhaps related to less-than-optimal nutrition – in fetal and early life are associated with an enhanced risk of both diabetes and cardiovascular disease many decades later. Large-vessel atherosclerosis can precede the development of diabetes, suggesting that rather than atherosclerosis being a complication of diabetes, both conditions may share genetic and environmental antecedents, a "common soil" . These same adverse environmental conditions associated with hyperinsulinemia and insulin resistance lead to the development in adult life of the dysmetabolic syndrome, consisting of abdominal obesity, impaired fasting glucose, high triglyceride levels, low high-density lipoprotein levels and hypertension. These constituents may be associated with additional elements, such as elevations in small low-density lipoproteins, prothrombotic factors and free fatty acids . Taking into consideration that the components of this cluster of abnormalities are essentially shared by both diabetes type 2 and atherosclerosis, the American Heart Association stated in 1999 that "diabetes is a cardiovascular disease" . Although the mechanism underlying this cluster is not yet fully clarified, the statistical association is well established . In this context, chronic low-grade inflammation is emerging as a conceivable etiologic mechanism. Inflammation plays an important role in mediating all phases of atherosclerosis, from initial recruitment of circulating cells to the inner arterial layer to weakening of the fibrous cap of the plaque, eventually leading to rupture. Inflammation is heavily involved in the onset and development of atherothrombotic disease, which is accompanied by the emergence of numerous inflammatory biomarkers. Such biomarkers comprise a vast array of substances, including cytokines as the interleukins, acute phase proteins, adhesion molecules, tumor necrosis factor (TNF) and monocyte chemoattractant protein (MCP) isoforms, interferons, chemokines, etc . Several studies have demonstrated an association between these biomarkers and current or future overt CAD [5–7]. A close relation is also present between the biomarkers and glucose metabolism abnormalities. For instance, obese patients with impaired fasting glucose exhibit elevated concentrations of interleukin (IL)-8 , glucose increases monocyte adhesion to human aortic endothelial cells via stimulation of IL-8 , and elevated levels of IL-18 and TNF-α were found in serum of patients with type 2 diabetes mellitus . Thus, a common inflammatory basis for both diabetes and CAD seems plausible . Interleukins are probably the most extensively produced biomarkers. Considerable confusion exists regarding their clinical value, due to several factors: 1) increased levels of a given IL, presenting statistical correlation with disease, does not necessarily imply causation; 2) these compounds are characterized by substantial redundancy in that different interleukins have similar functions; 3) many of them are pleiotropic, with capability of acting on different cell types; 4) interleukins may stimulate secretion of other interleukins, enhancing or inhibiting each other; 5) interleukins possess "paradoxical" effects, expressed as protective properties regarding a given system, whereas they may damage another system; 6) protective or noxious effects of a given interleukin may be concentration-dependent. A huge quantity of data regarding interleukins has been accumulating during the last two decades; a considerable part is dedicated to their effects on diabetes and cardiovascular function. However, no attempts have been made to present a systematic classification of interleukins based on their influences on these systems. Several essential questions remain yet unanswered: 1) does a favorable or harmful effect of a given IL on diabetes necessarily imply similar effects on atherosclerosis? 2) conversely, can the interleukins effects on atherosclerosis be extrapolated to diabetes? 3) can the absence of IL activity on one of these diseases predict lack of effects on the other? We will try to answer to these questions, describing a novel interleukins classification based on their role in diabetes and cardiovascular disease. Taking into account the alleged common inflammatory venue of these conditions, we hypothesize that the effects of each of the interleukins on both disorders will probably be moving in the same direction – regardless if harmful, favorable or neutral. If corroborated, this hypothesis could represent an additional step in building a unifying theory regarding the inflammatory basis of both type 2 diabetes and atherosclerosis. Interleukins are a wide spectrum of small regulatory protein molecules encompassed in the family of cytokines, exerting their effects via gene activation that leads to cellular stimulation, growth, differentiation, functional cell-surface receptor expression, and cellular effector function. In this regard, interleukins may exhibit marked effects on the regulation of immune responses and the pathogenesis of a great variety of diseases. Indeed, T cells have been categorized on the basis of the pattern of the interleukins that they secrete, resulting in either a cell-mediated immune response (TH1) or a humoral immune response (TH2) . The interleukins are produced by a great variety of cells, mainly monocytes, macrophages, neutrophils, T-cells, mast cells, eosinophils. However, it must be pointed out that this is only a partial list. Endothelial and epithelial cells, fibroblasts, smooth muscle cells, neuronal cells, tumoral cells, etc, represent additional sources. Interleukins were cloned two decades ago and since then new members have been discovered in an ever-increasing number, the latest being the recently described IL-28 and IL-29 . 1) Autocrine: acting on the same cell that secretes the IL, like IL-10. 2) Paracrine: acting on a cell located in an adjacent zone, like IL-12. 3) Endocrine: secreted into the general circulation and acting far from its source, like IL-11. This classification, while presenting some tutorial value, is imperfect because several interleukins overlap these categories. 1) Proinflammatory: secreted mainly by mononuclear phagocytes in response to infectious agents, such as IL-1, IL-6 and IL-8. 2) Immunoregulatory: involved in the activation, growth, and differentiation of lymphocytes and monocytes, like IL-2, IL-4 and IL-10. 3) Leukocyte developmental: regulating immature white cell growth and differentiation; IL-3 and IL-7 represent this category. This approach is also somewhat problematic, since it is more semantic than physiological. The term interleukin maybe haphazard in some cases. For instance, IL-2 was formerly known as "T-cell growth factor" and IL-11 as "adipogenesis inhibitory factor" . On the other hand, several agents – like TNF-α1, the monocyte chemoattractant protein (MCP) isoforms and the transforming growth factor-β – whose functions are similar to those of interleukins, are not regarded as such. Thus, this nomenclature may be arbitrary. 1) Noxious (the "bad"): interleukins provoking a cascade of events ensuing in development of macrophages and foam cells, fatty streak formation and ultimately stable or unstable fibrous plaque. Proinflammatory stimuli such as oxidatively modified low density lipoprotein cholesterol, free radicals, cigarette smoking, elevated plasma homocystein and infections, cause endothelial dysfunction leading to compensatory responses which alter the normal properties of the endothelium. This cascade of events is mediated by proinflammatory and chemoattractant interleukins produced by activated inflammatory, vascular smooth muscle and endothelial cells. The fatty streak is the earliest manifestation of atherosclerosis, consisting mainly of monocyte-derived macrophages and T-lymphocytes . The noxious interleukins also show a consistent relation to diabetes via glucose regulation of monocyte adhesion  alongside etiopathogenic roles and increased genetic susceptibility to diabetic nephropathy [10, 16]. 2) Protective (the "good"): interleukins representing a restraint for the development and progression of the atherothrombotic process. These compounds are involved in inhibition of proinflammatory agents production by activated monocytes or macrophages, suppression of IL-1, TNF-α and other cytokine activities, inhibition of matrix degrading MMP isforms, reduction of tissue factor expression and inhibition of apoptosis of macrophages and monocytes after infection. In addition, in diabetic experimental models, administration of protective interleukins results in maintenance of euglycemia even in the absence of insulin . 3) Aloof: this group includes interleukins whose influences on the cardiovascular system and on glucose metabolism are practically indifferent or not yet fully established. The members of each of these groups are depicted in Figure 1 and described in the following sections. 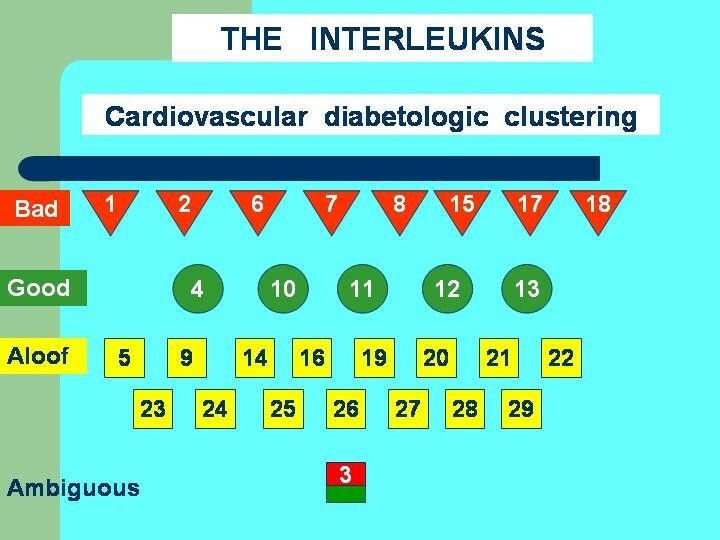 A cardiovascular diabetologic approach to the 29 known interleukins. The noxious interleukins ("bad") are depicted as red triangles, the protective ("good") as green circles, and the aloof as yellow squares. Interleukin-3 is depicted as a half red-half green square due to its ambiguity: albeit "good" in terms of glucose metabolism, it was not clustered into this group due to its effects on the heart (see text: Curtail of the scope). This group comprises eight members: IL-1, IL-2, IL-6, IL-7, IL-8, IL-15, IL-17 and IL-18. IL-1 is a glycoprotein existing in two major biologically active isoforms, the predominantly membrane-bound IL-1α and the secreted IL-1β. Of these, IL-1β is the principally circulating isoform. Monocytes, macrophages and macrophage-derived foam cells are the main sources of IL-1, but it is also produced by others such as endothelial cells . IL-1 mediates the inflammatory response occurring in the vascular wall during atherogenesis by activating monocytes and expression of adhesion molecules on endothelial cells, inducing secretion of other cytokines, chemokines and growth factors and stimulating smooth muscle cell proliferation . It also induces coagulation . As a key mediator of inflammation, IL-1 is plays a major role in the pathogenesis of CAD. Increased synthesis of IL-1 has been demonstrated in human arterial plaques , and serum concentrations of IL-1β are raised in patients with even minimal CAD . In addition, IL-1β has deletereous effects on pancreatic islets and insulin-secreting β-cell lines. It is well established that it inhibits β-cell function and is cytotoxic to human and rodent pancreatic islets in vitro . IL-2 is a T-cell derived cytokine involved in the activation, growth, and differentiation of a variety of cells, including lymphocytes and monocytes. Attempting to determine the relationship between T-lymphocyte activation and CAD by measuring plasma levels of cytokines related to T-lymphocyte function in coronary patients, high levels of IL-2 and soluble IL-2 receptor were found in those with stable but not unstable angina . It plays also a role in experimental diabetes. The nonobese diabetic mouse strain spontaneously develops autoimmune diabetes, which is characterized by insulitis, followed by selective destruction of β-cells in pancreatic islets. Evidence suggests that this β-cell destruction is mediated in part by IL-2; this cytokine was necessary and sufficient to direct naive T cells into the TH1 lineage . IL-6 is a secondary multifunctional proinflammatory cytokine. It regulates humoral and cellular responses and plays a central role in inflammation and tissue injury. Its effects are mediated through interaction with its receptor complex, IL-6R. This cytokine plays a very important role in the pathogenesis of CAD. Large quantities of IL-6 are found in human atherosclerotic plaques . IL-6 levels appear to be predictive of future CAD  and is elevated in patients with unstable angina compared with those with stable angina . Patients with persistently elevated IL-6 levels demonstrate a worse in-hospital outcome following admission with unstable angina [27, 28]. IL-6 also plays a role in diabetes. It has been shown that postmenopausal women with type 1 diabetes present higher serum bioactive IL-6 levels than matched healthy controls . Moreover, IL-6 polymorphism seems to be a genetic susceptibility factor for the progression of diabetic nephropathy . Recent data suggest a role for IL-7-driven inflammation in atherogenesis and the promotion of clinical instability in CAD involving interactions between platelets, monocytes, and chemokines . This is based on the fact that its plasma levels were significantly increased in patients with stable, and – particularly – unstable angina compared to healthy controls; increased release from activated platelets appeared to be a major contributor to raised IL-7 levels in patients with angina. In addition, IL-7 enhanced the expression of several inflammatory chemokines in peripheral blood mononuclear cells in both healthy subjects and patients with CAD, and aspirin reduced both spontaneous and stimulated release of IL-7 from platelets . Concerning diabetes, IL-7 is suggested to function through IL-2 production on mature T-cells , which can lead to β-cell destruction. IL-8 is a chemokine, or chemoattractant cytokine. Chemokines are members of a superfamily of small polypeptides mediating migration, growth and activation of leukocytes and a variety of other cells . Chemokines are designated CC and CXC, according to the spacing of the first two of four conserved cysteine residues. MCP-1 is the prototype of the CC class, where the first two cysteines are adjacent, whereas IL-8 and the recently discovered fractalkine  are prototypes for the CXC class, in which the first two cysteines are separated by a single aminoacid residue . IL-8 is expressed by macrophages and released after inflammatory stimuli in response to the primary cytokines IL-1β and TNF-α. It induces chemoattraction of monocytes and activated T-cells and can induce vascular smooth muscle cell proliferation and migration. In addition to causing local immune response, the recruited T-cells along with macrophages occur in large numbers at the sites of plaque rupture, playing a major role in atherogenesis . Inflammatory cytokines secreted by the T-cells are capable of inducing the expression of several MMP isoforms by macrophages leading to development of unstable plaques. Moreover, IL-8 and the soluble form of selectin-P may be useful clinical predictors of unstable CAD (33). Regarding glucose metabolism, monocyte MMP-1, 3, and 9 production are normal in type 2 diabetes , but plasma IL-8 concentrations after glucose load are increased in obese subjects with impaired fasting glucose in comparison to normoglycemic weight-matched individuals. These increased levels may be both insulin-mediated (by clamping) or glucose-mediated (during glucose tolerance test) . Additionally, it is well established that glucose itself increases monocyte adhesion to human aortic endothelial cells . IL-15 is a T cell growth factor that shares many functional similarities with IL-2, albeit no significant sequence homologies were found ; it has recently been shown to be present in tissue and organ allografts. IL-15 plays an important role in the rejection of a vascularized organ allograft and it was demonstrated that antagonists to IL-15 may be of therapeutic value in preventing allograft rejection . In mice models, IL-15 is a cytokine leading to destructive insulitis, as it elicits TH1-cytotoxic responses in both lymphoid and nonlymphoid immune cells and is unusually resistant to downregulation by antagonistic cytokines . IL-17 is a T cell-derived cytokine that stimulates stromal cells and macrophages to secrete proinflammatory cytokines. It may harmfully influence diabetes and atherosclerosis due to its capability to induce production of IL-6 and IL-8 . In addition, it plays a role in alloimmune responses, shortening the survival of heterotopic heart transplantation in animals. Interference with this activity might suppress allograft rejection, representing a novel target for therapeutic intervention in heart transplant rejection . In fact, IL-17 is a great family of isoforms sharing four highly conserved cysteine residues involved in the formation of intrachain disulfide linkages . IL-18 – functionally related to IL-1 – is a proinflammatory cytokine with multiple biologic functions . In concert with IL-12, IL-18 stimulates TH1 mediated immune responses. In addition, by itself it can stimulate TH2 cytokine production . IL-18 plays a central role in orchestrating the cytokine cascade and accelerates atherosclerosis and plaque vulnerability in animal models. Serum IL-18 level was identified as a strong independent predictor of death from cardiovascular causes in patients with CAD regardless of the clinical status, strongly supporting recent experimental evidence of IL-18-mediated inflammation leading to acceleration and vulnerability of atherosclerotic plaques . Moreover, IL-18 is raised in heart failure patients, in whom elevations correlate with poorer cardiac functional class and higher TNF-α concentrations. IL-18 appears likely to participate in the pathophysiology of congestive heart failure . Accumulating evidence suggests that this activity is supported by proinflammatory cytokines such as TNF-α, IL-1β and IL-6. Cytokine actions directly identified to date include promotion of systemic catabolism, myocardial depression, cardiac hypertrophy, and apoptosis of myocytes in congestive heart failure . In the context of glucose metabolism, preclinical stages of type 1 diabetes are characterized by infiltrating T cells and by the peri- and intraislet accumulation of proinflammatory mediators . Increased IL-18 expression is detected in islets during advanced stages of insulitis and correlates with elevated transcripts for interferon-γ and for the IL-18 receptor; the biological activity of IL-18 is blocked using caspase inhibitors and anti-IL-18 antibodies. It is established that beta cells produce bioactive IL-18 in the course of insulitis and actively contribute to the exacerbation of inflammation leading to their own demise . In addition, elevated levels of interleukin-18 and TNF-α in serum of patients with type 2 diabetes mellitus correlate with diabetic nephropathy . Five constituents are included in this category: IL-4, IL-10, IL-11, IL-12 and IL-13. IL-4 is a cytokine of the T-helper 2 (TH2) sub-type, mainly produced by activated T cells and mast cells. It is a pleiotropic cytokine that affects cells of multiple lineages, helping to stimulate antibody production. It possesses a striking ability to suppress proinflammatory responses such as IL-1 and TNF-α production . In heart transplant recipients, relatively high frequencies of IL-4-producing T cells have a beneficial effect on the outcome, being associated with less rejection episodes . This is manifested by IL-4 production within the donor heart, mainly by mast cells, and also by fibroblasts present in the donor's stromal elements . Concerning diabetes, children with parents with type 1 diabetes demonstrated an impairment in the ability to produce the IL-4 related immunoglobulin G4 antibody response to tetanus toxoid . This is consistent with a protective effect of IL-4 in early prediabetes . In addition, the combined administration of IL-4/IL-10 expression plasmids has demonstrated synergistic effects on the prevention of autoimmune diabetes. On the cellular level, the chimeric IL-4 and IL-10 expression plasmid can effectively reduce the incidence of autoimmune insulitis . IL-10 is secreted by activated monocytes/macrophages and lymphocytes, possessing multifaceted antiinflammatory properties. Its secretion leads to suppressed cytokine production, to inhibition of MMP isoforms expression, and to blockage of apoptosis of macrophages and monocytes after infection. All these inflammatory mechanisms have been shown to play a pivotal role for atherosclerotic lesion development and progression, suggesting a beneficial regulatory role of IL-10. Indeed, numerous recent experimental studies have shown that either systemic or local IL-10 gene transfer not only attenuates atherogenesis, but also affects processes associated with lesion progression . IL-10 is expressed in advanced human atherosclerosis and is associated with low inducible nitric oxide synthase expression and low levels of apoptosis, again suggesting a protective role of this antiinflammatory cytokine . A reduced IL-10 serum level is not only a marker of plaque instability favoring the development of acute coronary syndromes, but more importantly is indicative of a poor prognosis even after the occurrence of an acute ischemic event caused by plaque instability. In addition, the beneficial effect of elevated serum levels of IL-10 is restricted to patients with elevated CRP serum levels, indicative of an enhanced systemic inflammatory response . With regard to diabetes, experimental studies using gene-targeted mice  provide direct evidence that IL-10 offers some protection against endothelial dysfunction during diabetes and that this effect is mediated by inhibition of increases in O2 - in blood vessels. A source of this O2 - may be xanthine oxidase. It was also demonstrated that endogenous IL-10 is an important counterbalance to mechanisms that produce endothelial dysfunction during diabetes  and that mucosal administration of IL-10 enhances oral tolerance in both autoimmune encephalomyelitis and diabetes . These findings support the concept that IL-10 is also an important protective molecule in diabetes [49, 50]. Scarce data are available regarding the cardiac effects of IL-11. It was shown that myocytes and fibroblasts isolated from human atrium are able to secrete IL-6, IL-11 and leukaemia inhibitory factor; IL-11 could be involved in autocrine and/or paracrine networks regulating myocardial cytoprotection . The possibility of direct electrophysiologic effect on single human atrial myocytes was also considered, but not fully proved . IL-11 presents interesting effects on diabetes, in which the inability of insulin to properly signal and stimulate the translocation of the insulin-responsive glucose transporter in muscle, adipocytes and liver leads to hyperglycemia. Adipose tissue has been identified as a site of synthesis and secretion of the proinflammatory cytokine TNF-α, which, acting in an autocrine manner, leads to insulin resistance. In this context, IL-11 emerges as an antiinflammatory cytokine with receptors located on most cell types and tissues throughout the body, able to maintain euglycemia in the absence of insulin in animal models . IL-12 is produced by various immune cells (e.g., monocytes, macrophages, dendritic cells, and neutrophils). It activates natural killer cells and cytotoxic T-lymphocytes and induces the production of interferon-gamma. IL-12 is associated with the cell-mediated immune response. It has been demonstrated to present protective effects in animal models of viral myocarditis . This activity is enhanced by beta blockers, notably carvedilol, conferring thus a therapeutic benefit by upregulating the production of IL-12 and interferon gamma and by decreasing the virus load . Moreover, IL-12 can significantly delay the rejection of allograft in a neonatal rat heart graft model, and this effect is mediated by nitric oxide production . Initial data indicate a favorable action on glucose metabolism: lymphocyte T activation induced by IL-12 increases the expression of glucose transporter-like protein . IL-13 is a cytokine primarily produced by the T-helper-2 subset of lymphocytes that possesses powerful anti-inflammatory properties. It is synergistic with IL-4, diminishes insulitis and is capable of downregulating immunoinflammatory diabetogenic pathways in nonobese diabetic mice, and further supports the concept that IL-4-related anti-inflammatory cytokines might play a role in the prevention of type 1 diabetes . Regarding its cardiac aspects, proinflammatory cytokines participate in the worsening of cardiovascular function during heart failure, and their high circulating levels are related to the severity of myocardial dysfunction. Conversely, antiinflammatory cytokines are believed to exhibit low values in these cases. In this context, plasma IL-13 was not detected at all in patients with heart failure . This group of 15 includes the majority of interleukins known at present: IL-5, IL-9, IL-14, IL-16 and IL-19 through IL-29. Substantial effects on glucose metabolism and cardiovascular system have not been described for these compounds. IL-5, IL-9 and IL-16 are related to the respiratory system. IL-5 is mainly produced by activated T-cells and appears to be required for the accumulation of eosinophils and airway hyperresponsiveness in the inflammatory lung . IL-9 is known to regulate many cell types involved in T-helper type 2 responses classically associated with asthma, including B- and T-lymphocytes, mast cells, eosinophils and epithelial cells . IL-16 is a lymphocyte chemoattractant factor bearing no structural resemblance to other cytokines or chemokines and its aminoacid sequence is strongly preserved across species . It is related to asthma and also able to inhibit human immunovirus replication . IL-14 is a high molecular weight B-cell growth factor. Autocrine or paracrine production of IL-14 may play a significant role in the rapid proliferation of non-Hodgkin's lymphoma . IL-19, IL-20, IL-22 and IL-24 exhibit substantial sharing of receptor complexes. However, the biological effects of these four cytokines appear quite distinct: immune activity with IL-19, skin biology with IL-20, stimulation of production of acute-phase reactants with IL-22, and tumor apoptosis with IL-24 . Despite the fact that they are structurally closely related to the "good" IL-10, no protective effects have yet been described. IL-21 induces the apoptosis of resting and activated primary B cells  and is an hepatocyte-stimulating factor . Using gene-targeted mice lacking only IL-23, it was recently demonstrated that IL-23 is the critical cytokine for autoimmune inflammation of the brain . IL-25 is derived from TH2 T-cells. Infusion of mice with IL-25 induces IL-4, IL-5, and IL-13 gene expression, suggesting that IL-25 is capable of amplifying allergic type inflammatory responses by its actions on other cell types . IL-26 is a T-cell-derived cytokine, normally expressed at low levels but over-expressed after viral infection . IL-28 and IL-29, distantly related to type I interferons, are induced by viral infection and show antiviral activity [13, 68]. IL-27 is the newest addition to the "good" IL-12 cytokine family, presenting specific stimulation on naive CD4+ T cells in both mice and humans , but beneficial effects on diabetes or heart function were not yet decribed. It should be noted that the scope on interleukins depicted in this article presents several restrictions. These include genetic mapping, description of the numerous isoforms, characteristics of the IL receptors, general and specific antimicrobial and antiparasitic activities, role in tumoral and toxic diseases, etc. These issues were not discussed since they are beyond the span of this article. In addition, IL-3 was not included in any of the groups due to certain ambiguity. IL-3 – a hematopoietic and leukocyte developmental cytokine – shows multilineage colony stimulating factor, augments alloreactive bone marrow-derived suppressor cell activity in vivo and in vitro, and is capable of regulating extrathymic T cell development from the bone marrow [14, 70]. It is a "good" IL in terms of glucose metabolism, presenting defensive effects in experimental diabetes. Administration of IL-3 twice weekly starting at 2–4 weeks of age delayed the onset and reduced the overall incidence of diabetes in mice. Bone marrow cells obtained from IL-3-treated mice protected other mice from cyclophosphamide-induced diabetes . On the other hand, in spontaneously contracting cultured cardiac myocytes, perfusion with IL-3 induced arrhythmias resulting in a complete cessation of spontaneous contractions and a severe loss of myocyte inotropy; the effects were concentration-dependent and reversible . Thus, IL-3 appears to represent a special case, being the only IL whose effect is incongruous: protective for diabetes and noxious for the heart. However, it should be pinpointed that such noxious effects do not include proinflammatory or atherogenic activities. Atherosclerosis and diabetes present a pleiotropic progression in which inflammation appears to be a common background, and patients with diabetes experience accelerated atherosclerosis, which has been termed atheroscleropathy [72, 73]. Controlling the classical risk factors for CAD diminishes the incidence of both diseases. However, these risk factors are only partially successful in identifying many subjects who subsequently develop the ailments. The majority of myocardial infarctions are caused by coronary lesions presenting less than 50% luminal obstruction . Moreover, lipid deposition in the endothelium, per se, does not explain the proliferation of smooth muscle cells during atherogenesis. These facts herald the concept that the plaque biology may be a very important determinant of disease outcome. In addition to the degree of vessel stenosis, biochemical processes within the plaque – such as those harvested by interleukins – are now widely recognized as a crucial aspect of stability. Moreover, sequelae of chronic hyperglycemia, such as oxidative stress and increased protein kinase C production, are widely invoked as pathogenic mechanisms for accelerated atherosclerosis . Out of the 29 interleukins known at present, only one (IL-3) shows ambiguous performance and therefore was not clustered into a group. The other 28 exhibit harmonized physiologic behavior regarding diabetes and atherosclerosis; each one presents converging effects on both diseases. Eight interleukins are "bad" (IL-1, IL-2, IL-6, IL-7, IL-8, IL-15, IL-17 and IL-18), five are "good" (IL-4, IL-10, IL-11, IL-12 and IL-13), and the remaining fifteen are "aloof". According to this novel yield-based classification, the following implications may be drawn from the standpoint of cardiovascular diabetology: 1) a favorable effect of a given IL on either diabetes or atherosclerosis will predict a similar effect on the other; 2) equally, harmful IL effects on one disease can be extrapolated to the other; and 3) absence of influence of a given IL on one of these diseases forecasts lack of effects on the other. Several studies report on substantial reductions in the incidence of type 2 diabetes during pharmacologic interventions aimed to treat CAD. Such results were observed with angiotensin converting enzyme inhibitors [76, 77] and statins . Reciprocally, antihyperglycemic agents like glitazones have shown favorable effects on nontraditional biomarkers of cardiovascular disease, suggesting the presence of antiatherogenic effects , and treating impaired glucose tolerance patients with acarbose was associated with a significant reduction in the risk of cardiovascular disease and hypertension . Our present knowledge of the multifaceted physiological functions of interleukins allows the assumption that they play a pivotal role at the crossroad between glucose metabolism and atherothrombotic processes. These facts further support the unifying etiologic theory of both ailments emphasizing the importance of a cardiovascular diabetologic approach to interleukins for future research. Targeting of these cytokines – in an attempt to develop pharmacologic activators of the "good" interleukins, and inhibitors of the "bad" ones – might provide an effective means to simultaneously control both atherosclerosis and diabetes mellitus. This work was supported in part by the Cardiovascular Diabetology Research Foundation (RA 58-040-684-1), Holon, Israel, and the Research Authority of Tel-Aviv University (grant 01250234). EZF envisioned the concept and prepared the initial draft of the article. MM and AT critically revised the manuscript for important intellectual content. All authors read and approved the final version of the manuscript.